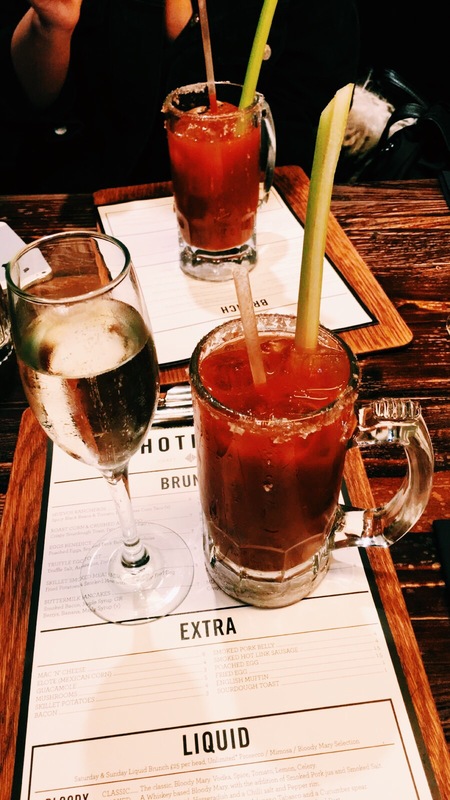 Right so, bottomless brunching in London. This is something of a hot topic these days and I’m always asked which ones are the best. I’ve been working my way through them (not as quickly as I’d have liked) and I’ve been planning on a mega blog post outlining the best and the worst in London right now. 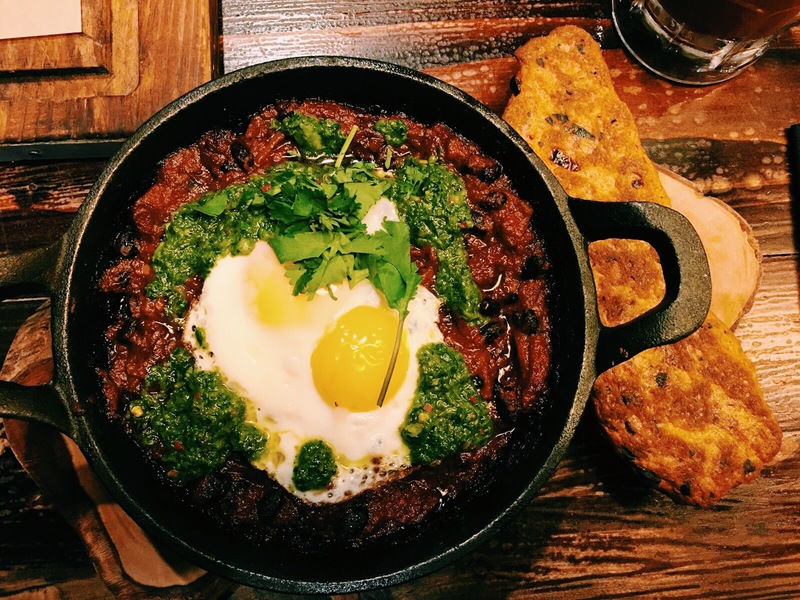 What I didn’t expect was to find a winner just four brunches in. You may be thinking, how do I know it’s the best if I’ve only ever tried four? Don’t worry about that, I know that without a doubt, absolutely no questions asked, Hotbox is the winner. 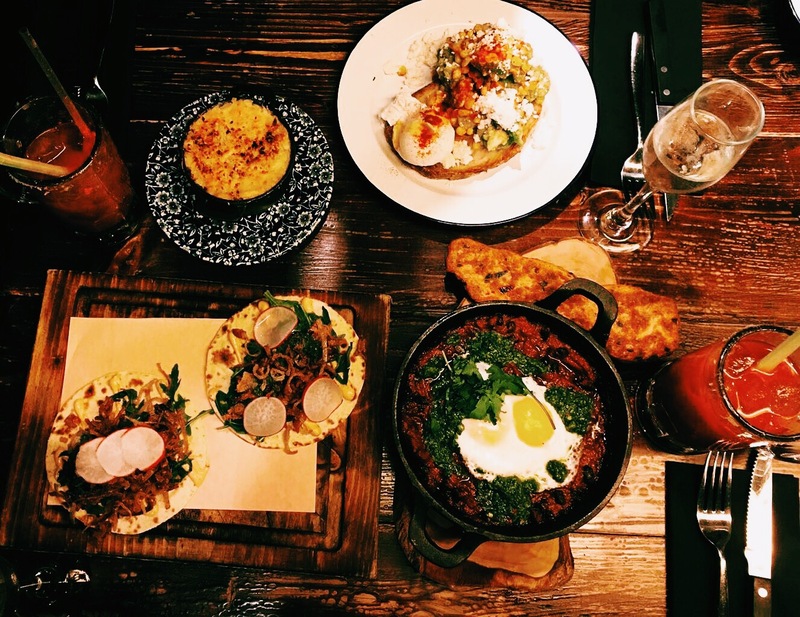 I’ve known that Hotbox’s brunch was pretty special ever since Rosie Londoner raved about it last year. 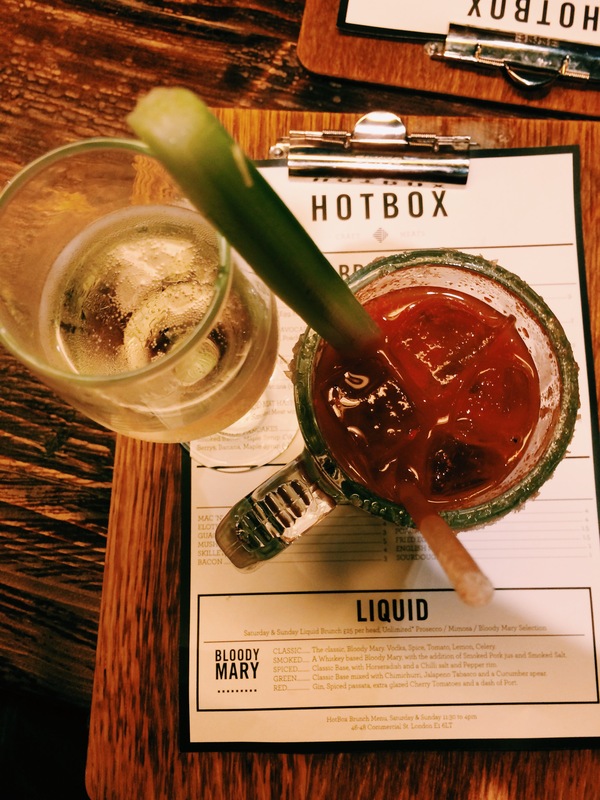 The thing is though, at £25 per head for the bottomless part alone, Hotbox seemed like one of the more expensive options and I’d heard you can’t book and you’ll be in a queue for hours – not ideal. I was so, so wrong. 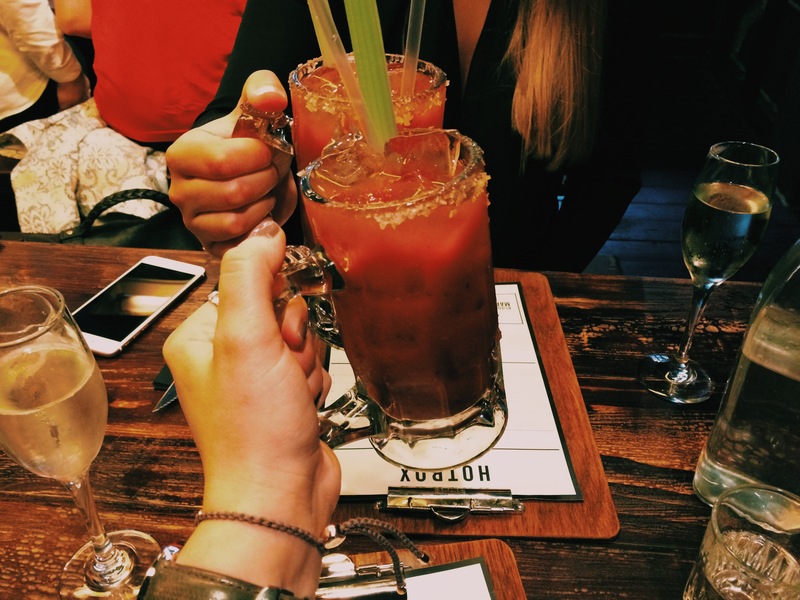 Firstly, £25 is an absolute steal for the five different types of Bloody Mary, Mimosas and Prosseco and yes you can flit between the three. 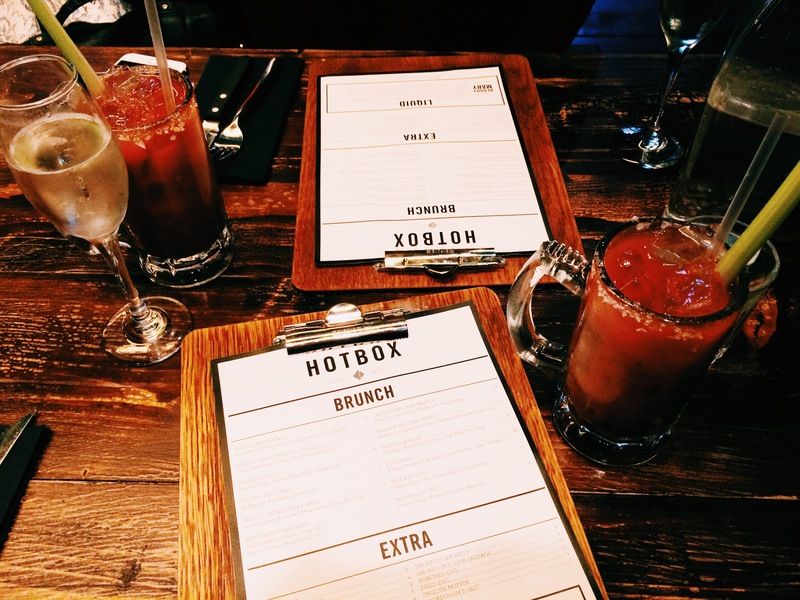 There’s no commitment at Hotbox, you can drink what you like and they’re extremely generous with the refills. So generous that we were still getting top ups 45 minutes after our allotted two hour time slot and my glass was pretty much NEVER empty; the sign of the perfect bottomless brunch if you ask me. And you can book, so queuing isn’t even an issue. I could sit and talk to you about the service all day, it was beyond anything I’ve ever experienced in a restaurant (that has no idea I’m going to be writing about it) and beyond anything I’d ever expect from a bottomless brunch – previous brunch experiences have resulted in moody waiting staff tutting at the request of a top up (not cool Bad Egg – and yes your eggs are bad, they’re not runny. Fail). Our server Adam excelled himself, he moved us from the bar stools to a table without me having to ask (major points) and he managed to be super attentive despite the fact that the restaurant was rammed. I’ve also got to give a shout out to Reewa for putting up with two very drunk annoying girls whilst Adam was on his break and not for getting annoyed at my repetitive screeching of ‘Re ee WA – when the crowd say Bo, SELECTA’. The fact that I haven’t even mentioned the food yet is absolutely no reflection on the food whatsoever. The meal was actually by far the most spectacular part of our visit. It was so good that we actually nearly cried when we tasted the Mac ‘n’ Cheese – no exaggeration at all. I’m going to spend a little bit of time talking about (and reminiscing over) the cheesy, creamy, gooey, carby side dish of dreams. Please note, this is just a side dish. Hotbox doesnt boast to have the best Mac ‘n’ Cheese in London and they don’t fuss about with things like jalapeños or lobster to make it fancy. They just serve it in a skillet and charge £6 for what is probably the best Mac ‘n’ Cheese side I’ve ever tasted. It’s good for its simplicity and flavour and not for trying to be something it’s not. It’s a must have, trust me on this. As well as the Mac we ordered the Huevos Rancheros, as I always do when it’s on the menu. Now I’ve had my fair share of Mexican egg dishes and at the risk of sounding like a broken record, I can safely say this is 100% the best. It’s also vegetarian which is totally shocking because its rich and decadent and so satisfying you’d never miss the meat. It’s served with some sort of bready goodness to dunk in it and boy did I dunk. 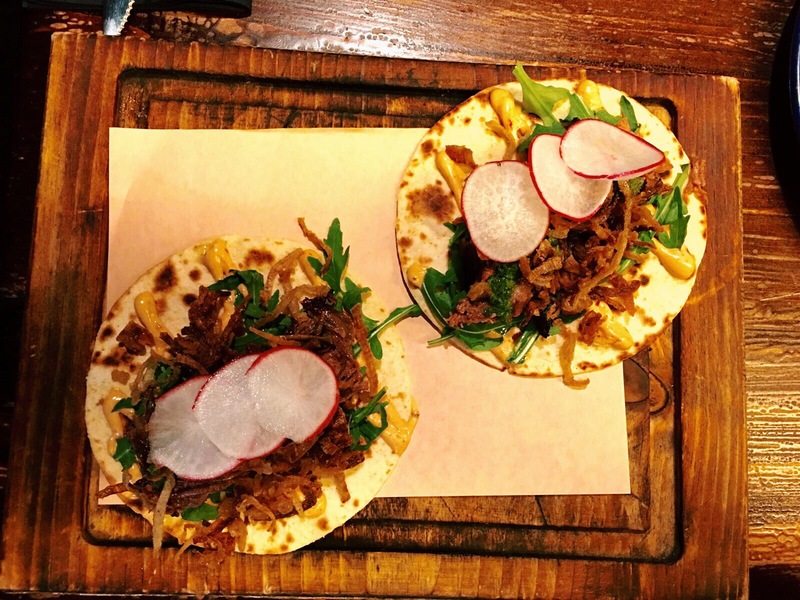 On Rosie Londoner’s recommendation we ordered the Beef Rib Tacos and I totally know what she’s banging on about. They’re beyond sensational and cannot be missed. 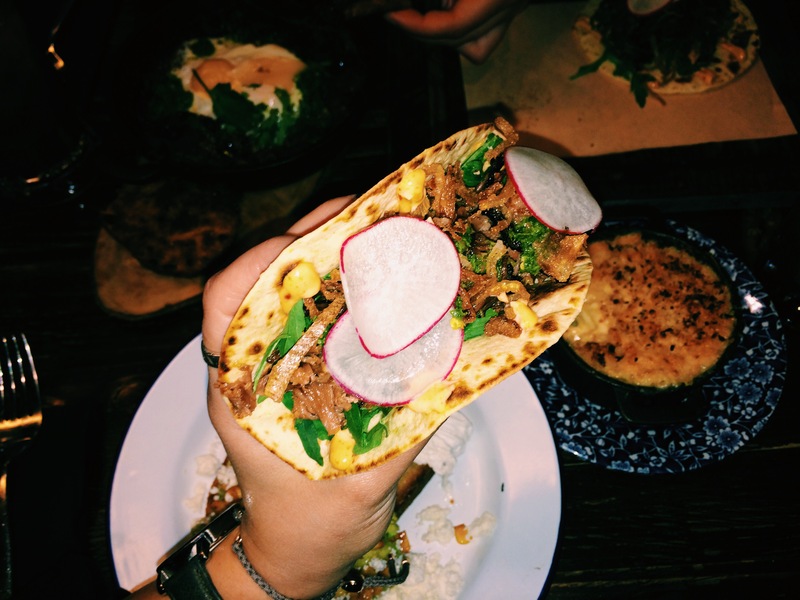 Apparently 2016 is the year of the taco and if that’s the case then this is Hotbox’s time to shine. Some mistakes are beautiful. 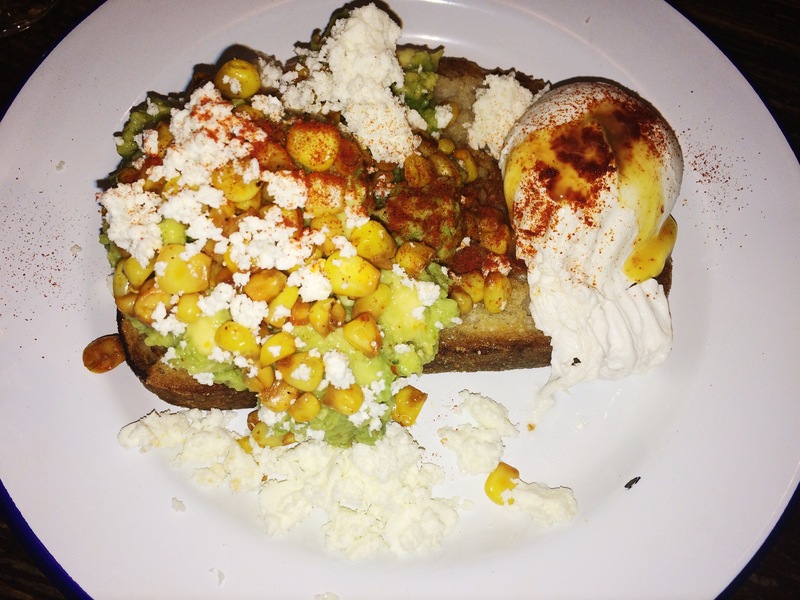 We ordered a side of Elote (Mexican Corn) and ended up with Roast Corn & Crushed Avocado on Sourdough Toast with Feta and a Poached Egg. This was the best mistake ever made and it was even on the house because of the misunderstanding. Life doesn’t get better right? Avo toast is a winner on its own but with the addition of those three ingredients it went from middle class white girl to Emily Ratajowski in under ten seconds. I’ll be recreating it (and in no way living up to it) at home this weekend and cannot wait.